"Where is the magic lamp? Do you not have it any more?" Although Walt Disney's Snow White and the Seven Dwarfs is generally credited as the first full-length animated feature, he was beaten to the punch by over a decade. Over a three year period, a young woman, Lotte Reiniger, together with her husband and a few assistants, created an astonishing stop-motion animation film comprised entirely of paper silhouette cutouts. Put any thoughts of South Park out of your mind. The cutouts here are truly amazing in their ornate filigrees and liveliness. With this restoration, The Adventures of Prince Achmed can finally take its rightful place in animation history. The film is based on several stories from the Arabian Nights. 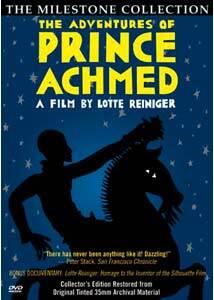 The adventures center on a wicked magician who approaches Prince Achmed with the offer of a flying horse. When Achmed offers the magician anything in his kingdom, he is shocked to learn that the magician claims Achmed's sister as payment. Unable to control the horse, Achmed winds up on the Isle of Wak-Wak, where he meets the bird princess Pari Banu and falls in love. But their escape is cut short when her demonic subjects come to reclaim her. The only way for him to rescue Pari Banu is with the magic lamp of Aladdin, and Achmed sets off for that legendary artifact—which the magician has seized for himself. The animation, depending on the circumstances, ranges from crude to insanely beautiful. The delicacy of the princesses and their garb is set off against the distorted and comical look of the magician and a witch. The patience that must have been required in moving such delicate, jointed figures (often dozens of them in the scene at once) is amazing. A few screengrabs are provided to give a visual idea of the complexity and beauty of the silhouettes. Unfortunately, the original negative and all original German prints have been lost. This rendition is a painstaking recreation from a fragmentary English nitrate print. It's not clear, though, what might be missing, sincethe continuity seems to be undisturbed. The ornate German intertitles are recreated from the period censor records. They are a gorgeous rendition of the German letters in a stylized Arabic-type script that I found entrancing. Optional English subtitles are also included. An alternate audio track givesthe intertitles in spoken English so that it can be enjoyed by younger children as well. The story is completely charming, and although there is some minor swordplay, the monsters mostly seem ridiculous rather than terrifying. There's also a comic wizard's battle that seems to have been a clear influence on Disney's The Sword in the Stone. The imaginative and truly inspired visuals should keep most children interested for the fairly short running time. But adults will also find much to like in the sheer technical beauty and elaborate nature of the cutout silhouettes and their convincing stop-motion animation. Image Transfer Review: The full-frame picture generally looks quite nice, with crisp and beautiful edges and fine detailing on the cutouts plainly visible. The film is given heavy tints in vibrant colors, which unfortunately tend to wash out the subtle, delicate grey and white backgrounds. The result often makes the silhouettes look as if they're floating in air, but the backgrounds occasionally peek through even in those segments. A bigger drawback is that the disc doesn't seem to be properly flagged for progressive playback. As a result there are times (especially in the documentary) where two film frames will appear in a single mpeg frame. This isn't distracting in the main feature, where it only results in occasional blur, but in the film clips in the documentary there is frequent ghosting as a result. Audio Transfer Review: The original orchestral score by Wolfgang Zeller is provided here in a new recording. The sound is clean, with excellent presence and depth. The sound has a rich fullness to it, though not much in the way of surround effects. The voiceover track tends to be a shade overwhelming, drowning out the music. Extras Review: The disc contains an excellent 1999 documentary (59m:16s) on creator Lotte Reiniger, directed by Katja Ratagnelli. Although giving a good deal of biographical information, the documentary is wisely well-peppered with various of Reiniger's silhouette films from the 1920s through the 1970s, including her adaptation of operas such as Carmen and The Magic Flute as well as a wide variety of fairy tales from Cinderella to The Gallant Little Tailor and Thumbelina. The tales of hardship that she endured in pursuing her art are fascinating. Even though she and husband Carl Koch (cinematographer for many of Jean Renoir's greatest films, including Grand Illusion and The Rules of the Game) had fled Nazi Germany in the 1930s to live in England, a bit of bad timing brought them to Italy to work with Renoir just as the war broke out. Renoir departed, leaving them unable to return to England. Left with no choice but to return to Germany, they struggled to make ends meet, with Lotte animating The Golden Goose in exchange for ration stamps to keep the pair of them from starving. But throughout everything, she kept her fascination with her little shadow plays. "I was the obsessive, the crackpot," she good-humoredly jokes about herself at one point in the film. This documentary will help place the feature in proper historical context and gives real gravity to the circumstances under which such wonderful little pictures were created. As an added bonus, a 2m:35s advertising short for Nivea Soap created by Lotte is also provided here; it's equally as gorgeous as the feature film, though this time with white silhouettes on a black background. Finally, there is a set of about 50 programmed photographs of Reiniger at work and scenes from various of her silhouette films. I find it hard to imagine a better presentation of extras on a single disc. An incredible piece of animation work, with a good transfer and significant extras to boot. Very highly recommended for all ages.